Pianist and bandleader Chick Corea will be this year’s Artist-In-Residence at the Detroit Jazz Festival over Labor Day weekend. He will play with his Akoustic Band, Elektric Band and his sextet plus the Detroit Festival Symphony Orchestra. 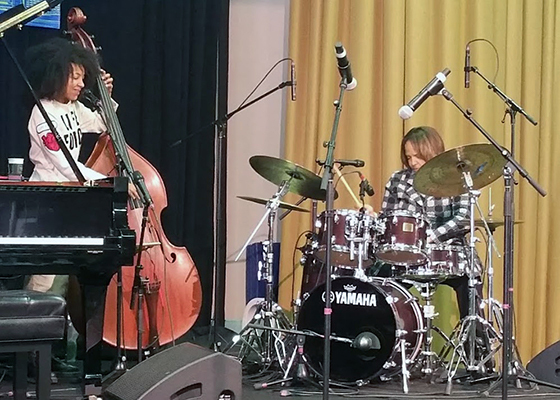 This year the festival has a Resident Ensemble of bassist Esperanza Spalding and drummer Terri Lyne Carrington (above). They will be part of a tribute to Geri Allen who left us last year after leaving a significant mark on the jazz scene in Detroit and the world. Things kick off on Friday, August 31, at the Main Stage on Campus Martius with a New Orleans Brass Band led by drummer Shannon Powell at 6:30 p.m. followed by the Geri Allen Tribute at 7:00 p.m. and the Chick Corea Akoustic band at 9:00 p.m. Notable names in the lineup are: Dr Lonnie Smith’s Organ Trio (Saturday), organist Joey DeFrancesco (Labor Day), trumpeter Nicholas Payton (Saturday), saxophonist Ravi Coltrane (Saturday), bassist Marcus Miller (Sunday), guitarist Pat Martino (Sunday), the Brecker Brothers Reunion Band (Labor Day), and vocalist Cecile McLorin Salvant (Labor Day). Many former Detroiters will be featured for example violinist Regina Carter in a Straight Ahead 25th Anniversary Reunion (Saturday), and drummer Karriem Riggins’ Detroit Generations (Sunday). For a more detailed schedule, please visit the Detroit Jazz Festival website.